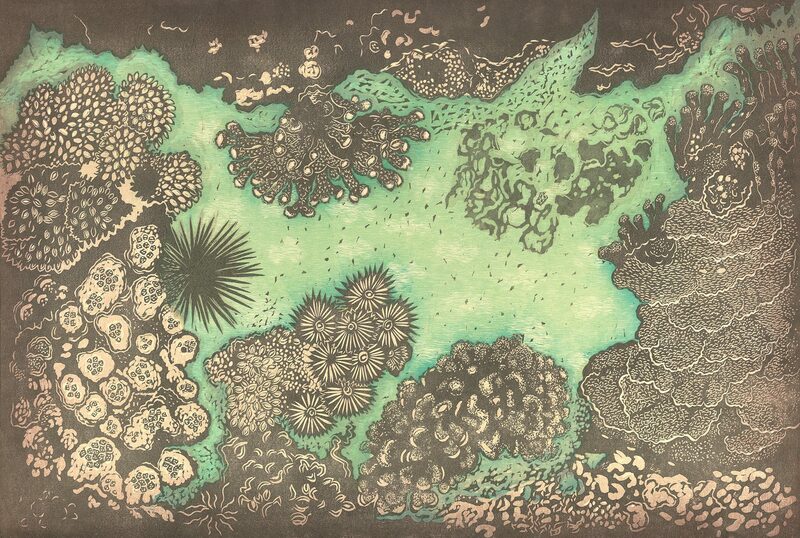 “Coral Garden” woodcut print was inspired by the sculptural beauty of Hawaii’s coral reefs. Corals are a central living structure of the Hawaii reef ecosystem. The amazing life that we see on the reef- fish, eels, shells, crustaceans, and so much more that is invisible to us, interacts with the coral in complex symbiotic relationships. The idea for this image arose after the bleaching event that devastated Kona’s reefs in 2015. It happened so fast. One summer day I was snorkeling at Captain Cook Monument and saw beautiful amethyst-colored corals. I quickly realized something was different, and when I looked closer I saw that the golden-colored surface polyps were gone and the coral was dead. The next time I visited stony shapes were white and shortly after that the algae moved in. In many areas the corals are growing again, and yet it will take many years for the reefs to recover their former diversity and beauty. I included my favorite corals on Hawaii’s reefs. These corals are not always found together, but I’ve taken artistic license to evoke the feeling and beauty of coral gardens. The plate and pillar corals on the right are common in Kealakekua bay. I love to hug the rocky shoreline when snorkeling. I’ve found huge cowries on rock shelves and once, a mass of several species of eels together. That was weird! The rocky shore is a boundary between the land and reef supporting a lot of life, and is shown at the top of the print. This is a reduction woodcut print on Rives French archival paper. It has beautiful deckle edges and is suited to float mount framing.